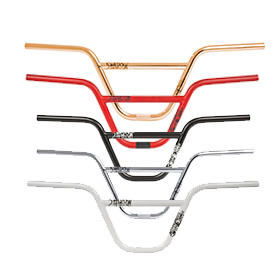 The 24umph XL Bars are the tallest 24″ BMX bike bars on the market today. Measuring ..
Multi Butted Chromoly 4 pc bars with full post weld heat treatment. Available in black. Width - 28" .. The Colin Varanyak signature bar. Multi Butted Chromoly 2 pc Bars. Available 9.5” and 9.0” rise. Pos..
Multi-Butted Chromoly 4 pc Bars. Post Weld Heat Treatment. Rise: 9.5" Width: 29.5" Backsweep: 11° Up..
Cult Butter BMX BarsChase Dehart signature bars. 100% heat treated butted chromoly, 8.5 rise, 29" wi..
* Made from 100% heat treated butted chromoly * * Classic feel good geometry * * Three..
* Made from 100% heat treated butted chromoly * 29" width, 12° backsweep, 4° upsweep ** black &..
Dak Bars / 1" OD7/8 bar with a beefy but slick 1" OD clamping area for EXTRA strength...ONLY WO..
* Chase Hawk signature bars * * Made from 100% heat treated butted chromoly * 29" width, 10° bac..
Cult Leader 8.5 Inch BarsFull 4130 chrome moly multi-butted Cult Leader bars in 8.5 rise / 28.75 inc..
Cult Leader 8.75 Inch BarsFull 4130 chrome moly multi-butted Cult Leader bars in 8.75 rise / 28.75 i..
Cuatro Bars / 1" OD7/8 bar with a beefy but slick 1" OD clamping area for EXTRA strength...ONLY..
5.75" rise just what you need to get ahead at the track... * Made from 100% heat treated butted ..
* Vick Behm signature bars ** Made from 100% heat treated butted chromoly *8.5" rise ** black &..
Specs: Heat-treated multiple butted chromoly with Stefan’s size and angles choice .. This year for the Fuego bars we have 2 sizes; the original 9" tall and now come in 9.5" rise. Both c.. Along the lines as the frame, the Geo bars are available in two taller height options and comes in f..
- Bar - Rise: 9.00" Width: 29" Side sweep: 12º Up sweep: 2º..
As with everything we do here at Flybikes, we look to our team for inspiration and direction, and de..
Mutiny The Glamroid Bars 8.5" are extra wide (76.2cm) handlebars made of heat treated butted 4130 Cr..
MATERIAL4130, multi butted tubing with thicker gauge areas at key stress points and finished with po.. The Sweepstakes is a big, comfortable bar that comes in at 29″ wide and 9″ tall. Specs 9″ r..
Modern spec bars that won't break the bank. 11" Back, 2" Up sweep, 27" wide with a tighter box ..
Craig Passero's signature bar. Made from heat-treated straight gauge chromoly for extra durabilit..
Street style for miles with strong 4pc design. Wide box, 100% 4130 chromoly plain gauge construction..
Big and strong with modern spec. Great for the Beginning rider, but strong enough for mid level and ..
4 piece bars are badass and popular, so we expanded our Crowbar Handlebar range. Now available in ..
Johnny Devlin is a 4pc handlebar advocate. Over the years he has ridden many a pair, so we put his v.. Unique tear shaped crossbar 100% heat treatment after welding 13 butted chromoly 2" / 4" = 24".. The Shadow Vultus Bars are now available in 2 versions – Vultus Featherweight and Vultus SG. The F.. The Shadow Conspiracy Vultus SG bars are made from straight gauge, heat-treated chromoly tubing as.. Unique tear shaped crossbar100% heat treatment after welding 13 butted chromoly10 degree back s.. The Haze Bar is a 2-pc. bar made from multi-butted 4130 chromoly tubing and features a 19mm crossbar.. The Stranger Piston Bar is Connor Keating's signature 4-piece bar. Specifications: Rise: 9.25.. The Stranger Zaferia Bar is Eric L's signature 4-piece bar. Specifications: Rise: 9.75" W..
Nate Richter's signature Zia Bar is a 2-pc. bar made from post-weld heat-treated multi-butted 4130 C..
- Lahsaan Kobza signature model - 100% post weld Deathproof heat treatment - Oval Crossbar shape ..
Noster Bars Simone Barraco Signature Bars 13 butted chromoly Full Deathproof heat treatmen.. The Subrosa Pandora bars are 100% post weld heat treated chromoly, and 13-butted to keep w.. Some things never change. The feeling of a 12° back 1° up bar is one of those things, and that’s jus..
Villicus Handlebar Hoang Tran signature model 100% post weld Deathproof heat treatment 13 b..
Hoang Tran signature model 100% post weld Deathproof heat treatment 13 butted chromoly 29" wid.. Broadcaster Bars are our tallest bars to date, measuring in at an 8.9″ rise. They are 28.5″ wide and..
Made to Mark's specific dimensions, these bars are truly a signature product. They feature a 20mm..
With 12 degrees of backsweep, 4 degrees of upsweep and clocking in at 29″ wide by 9.75″ tall, these ..
Based on team rider feedback, Sunday introduces the new Nightshift Handlebars.FEATURES10” Rise30” Wi..
Jake Seeley is a tech street wizard, so he should have his very own bars to aid in the wizardry. We'..
With 11 degrees of backsweep, 1.5 degrees of upsweep and clocking in at 29″ wide by 9.25″ tall, thes.. Height 7.625″ Center to Center Width 24.5″ Crossbar Height 5.0″ Center to Center Sweep 12 d..